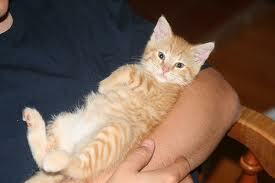 1) Pick up your cute little kitty and cradle it in the crook of your left arm, almost as if you were holding a baby. Position your right forefinger and thumb on either side of cat’s mouth and gently gently gently apply pressure to the cat’s cheeks while holding the pill in your right hand. As soon as the cat opens its mouth, pop the pill in. Allow the cat to close its mouth and swallow the pill. 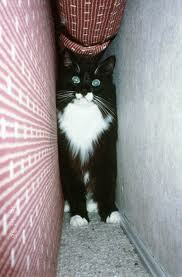 2) Retrieve the pill from the floor and your cat from behind the sofa/bed/wardrobe. Again cradle the cat in your left arm and repeat the process. 3) Retrieve your cat from wherever its run off to hide and throw away the by-now soggy and useless pill. 4) Take a new pill from the pack and again cradle your cat in your left arm, this time tightly holding the rear paws with your left hand. Force the cat’s tightly gripped jaws open and push the pill towards the back of the mouth with your right forefinger. Hold the cat’s mouth shut for the count of 10. 5) Retrieve the pill from whatever corner the cat discarded it in, and retrieve your cat from the top of the wardrobe/shelf/fridge. Call your partner/family member/housemate from whatever they’re currently doing. 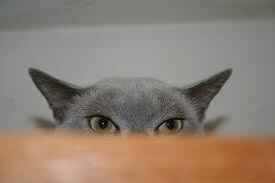 7) Retrieve your cat from the top of the curtain rail. Get another pill from the packet. Make a note that you need to buy new ruler and repair the curtains. Carefully sweep up the pieces of shattered figurines and vases from the floor and set to one side for gluing later on. 8) Wrap your cat in a large towel and get your partner/family member/housemate to lie on top of the cat with the cat’s head just visible from below their armpit. Put the pill into the end of a drinking straw, force the cat’s mouth open with a pencil and and blow down the drinking straw. 9) Check the pill packaging to make sure the pill is not harmful to humans and drink a beer to both take the taste away and calm yourself down. Put a plaster/band-aid onto your partner/family member/housemate’s arm and quickly remove the blood from the carpet with cold water and soap before it has time to settle in and stain. 10) Retrieve your cat from the neighbours garden. Get another pill and open another beer. Wrap a towel around your cat’s neck and put your cat into a cupboard, then gently close the door onto the neck, ensuring that the cat’s head is showing. Pry open the cat’s mouth with a spoon and flick the pill down the throat with an elastic band. 11) Fetch a screwdriver from tool shed/garage and put the cupboard door back onto its hinges. Drink the beer. Fetch a bottle of whisky, pour a shot and drink. Apply a cold compress to your cheek and check your records for the date of your last tetanus shot. Apply a whisky compress to your cheek to disinfect it. Drink another shot. Throw the tattered remains of your T-shirt away and get another one. 12) Call the fire department to retrieve the cat from the top of the tree across the road. 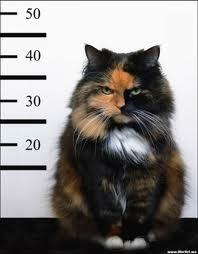 Apologise to the neighbor who crashed into a fence while swerving to avoid your cat. Take the last pill from the package. 13) Using heavy-duty pruning gloves from shed, tie the little furry gits front paws to its rear paws with garden twine and bind tightly to the leg of a table. Push the pill into the cat’s mouth followed by a large piece of filet steak. Hold the cat’s head vertical and pour two pints of water down its throat to wash the pill down. 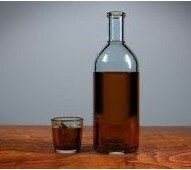 14) Consume the remainder of the whisky. Get your partner/family member/ housemate to drive you to the Emergency Room. Sit quietly while the doctor stitches your fingers and arm, as well as removing bits of pill from up your nose. Enjoy being out of the house. Call a furniture shop on the way home to order a new table. 15) Arrange for the ASPCA/RSPCA to collect that infernal mutant cat from hell and call a local pet shop to see if they have any hamsters or goldfish. 1) Wrap the pill in a piece of bacon. 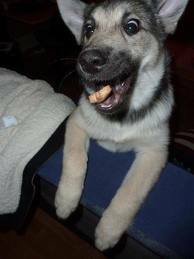 2) Throw the bacon parcel into the air. Note: this ‘How To’ is purely fictitious and comical, and the instructions above should not be attempted or replicated in any way. Instead follow the official instructions on your pets medicine packet. Previous Post Suicidal Eggs: Clever Advertising Campaign Or In Poor Taste?